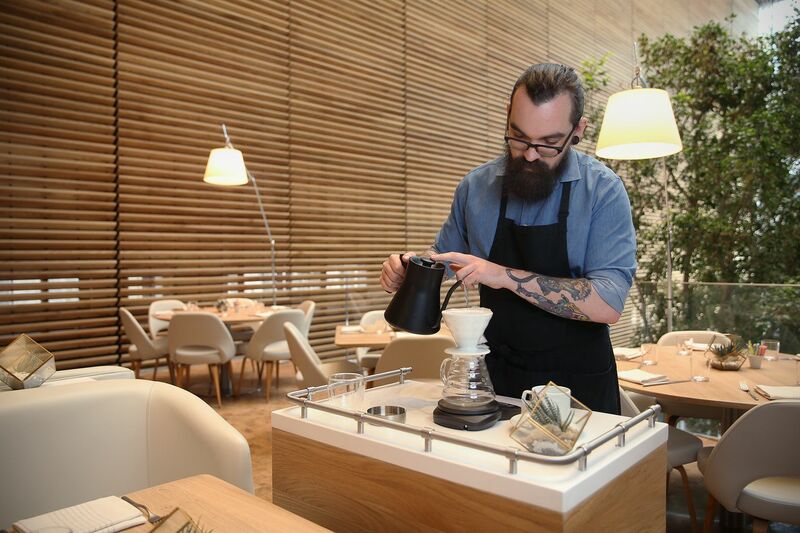 Barista Drew Chrisner demonstrates the tableside pour-over coffee at Vernick Coffee Bar inside the Comcast Technology Center. The geniuses among us see vibrant possibilities where most others see the mundane. A simple coffee kiosk? It’s not hard to imagine one in the lobby of an office building. And, yes, there are two cherry-red La Marzoccos steaming away beneath the spaceship glow of the long oval hub of Vernick Coffee Bar, which anchors the second-floor mezzanine of the Comcast Technology Center on 18th Street. Vernick Coffee Bar sits inside the lobby of the Comcast Technology Center in Center City. The building is the city's tallest skyscraper. But Comcast’s new skyscraper, as my colleague Inga Saffron recently noted in her glowing architectural review, is not your ordinary office building. And neither is Greg Vernick an ordinary chef. Anyone who’s visited his signature four-bell restaurant on Walnut Street knows he has a talent for elevating seemingly prosaic concepts like “toast” or “roast chicken” to exciting new dimensions that far exceed their minimalist billing. And that mantra holds true at the Vernick Coffee Bar, where some common dishes — oatmeal, grilled romaine, miso soup — have been reinterpreted in ways I can’t stop thinking about. Yes, great expectations still await the chef’s grand American seafood project, Vernick Fish, set to open on the building’s ground floor once the Four Seasons hotel, Vernick’s partner in both venues, gets its liquor license sometime this year. But the Coffee Bar should not be overlooked. Because it’s so much more than a coffee bar. People eat in the dining area of Vernick Coffee Bar, a mezzanine perch that sits above the ground-floor lobby like an urban treehouse. And the possibilities — not simply to refine the cafe experience, but to create a civilized destination for a business district breakfast and lunch (or afternoon toast, which just launched) — immediately sparked in Vernick’s brain when he saw the space. Tucked into an open aerie beyond the kiosk beside the oak-louvered walls of the soaring 70-foot tall atrium, this 40-seat mezzanine dining room of white leather furniture and wood tabletops hovers over the lobby’s grove of weeping figs like a tranquil urban tree-house oasis. Potted plants, living room lamps, and cheerful servers in denim shirts lend the space a warm hint of human intimacy. It’s Vernick’s culinary approach, though — along with contributions from a team led by chef de cuisine Andrew Parassio, pastry chef Ryan Schmitt, and baker Danielle Seipp — that elevates virtually every aspect of this multifaceted experience. Let me count the ways. The pastry counter at Vernick Coffee Bar. 1. Coffee shop basics refined, with better food. Any coffee business needs to do right by its beans, and if you experience Vernick’s version through its takeout kiosk, the standards are good to excellent, with well-balanced blends from Seattle’s Caffè Umbria as worthy workhorse beans used for large-batch brews and espresso drinks, and a rotating list of local stars (Ultimo, ReAnimator) for single-origin pour-overs. There are other cafes nearby (Square One, Nook) that roast their own beans and brew just as well, if not better, but Vernick really separates itself with its wide range of house-made grab-and-go breakfast items. There are creamy coconut chia-açaí parfaits and potent juice shots for the health-conscious (loved the apple-ginger and turmeric-tangerine; I’m not masochistic enough to embrace the spicy sour of the pomegranate-tamarind-cayenne shooter). The "corner-store egg-and-cheese" breakfast sandwich updates the city's blue-collar classic. The pastry case, though, is where it’s at. There’s an impressive array of buttery-but-inventive viennoiserie, like sugar-crusted kouign-amanns oozing strawberry-passion fruit caramel, a pain au chocolat scented with orange, and gingery matcha green tea croissants rolled around ribbons of white chocolate. (Skip the exceedingly dry seven-grain croissant, because if it still has a croissant’s worth of butter — and it does — what’s the point?) The warm sourdough biscuit with sticky marmalade is another salty-sweet indulgence, and the quiche verte is stuffed with so much greenery — Swiss chard, kale, spinach, and broccoli stems baked into a rich custard tinged with chili heat — its chlorophyll boost beats a smoothie. But Vernick Coffee, posh as it is, also pays affordable homage to Philly’s blue-collar breakfast classic with the “corner store egg-and-cheese.” At $5.50, it’s a hearty deal that sandwiches a disc of silky steamed egg with zesty arugula pesto and melty Vermont cheddar inside a house-baked bun that’s soft but that still crackles with delicate crust. The steel-cut oatmeal at Vernick Coffee Bar is transformed into a souffle. 2. Oatmeal rising. If Vernick’s kitchen still has room to grow, it is in figuring out a clear identity for its sit-down breakfast. A traditionalist pal argued that one of the signature dishes, a green pea hummus with the pita chip crunch of a fatoush tomato salad paired with a seven-minute egg (yolk still glossy inside), cheats too much toward lunch fare. And, true, the Coffee Bar’s limited induction-burner kitchen space means this isn’t your typical pancake-omelet bar kind of breakfast menu. But the oatmeal alone is a revelation. Vernick takes the steel-cut variety, which commonly arrives elsewhere as some variation on wallpaper paste, and transforms it into an ethereal soufflé that suspends the nutty beads of grain in a citrusy sweet cloud, with a pouf of maple-sweetened whipped cream on the side for added depth. The grilled romaine at Vernick Coffee Bar brings layers of fruit, melted cheddar and buttermilk vinaigrette. 3. Rethinking romaine. If you told me I was going to rave about a head of lettuce gratinéed with cheese, I would have said you were nuts. But apparently, I missed the grilled romaine era at Vernick Food & Drink when this salad was so popular they had to take it off the menu. (Because chefs are artists, right?) Thankfully, it’s been revived at Vernick Coffee, and it’s so much more complex than the grilled Caesars of the early 2000s that I’m sliding happily back to the future. It’s a strange dish to behold, a canoe-like hollow of romaine oozing like a grilled cheese studded with fruit. But it’s all about contrasting textures and flavors — the smoky singe and crunch of lettuce cradling sweet chunks of fig and dried cherries warmed in the salty flow of molten Grafton cheddar. A zesty ribbon of mustard-spiced buttermilk vinaigrette inside cuts the richness and lifts each satisfyingly savory bite with a lively, unifying tartness. The miso soup at Vernick Coffee Bar comes with beech mushrooms and shiso-dill oil. 4. Soup master. I spooned through several stellar soups at Vernick Coffee Bar, including a butternut squash and sage soup shaded with a half-moon of grated hazelnuts candied in cocoa, and an earthy chestnut puree imbued with truffles. But the spicy miso soup is a gorgeous bowl that haunts me, because it shows the mastery of the world pantry that gives Vernick’s food such an effortless global fluency. At first sip, it tastes like traditional miso soup, with smoky notes of bonito in its kombu broth. But one quickly realizes it’s been amped and altered, lightly enriched with pureed mushrooms that lend an earthy creaminess that’s also deepened with chicken stock. Emerald beads of herbaceous shiso-dill oil pool inside the elegant long-stemmed beech mushrooms that bob on top, their miniature caps cradling thimblefuls of the soup that deliver tiny bursts of intense umami. My only gripe? It may be “spicy" for Comcast’s corporate captains, but I craved some extra heat. The wild mushroom and avocado grain bowl at Vernick Coffee. 5. Healthy satisfaction. I’m always seeking healthy dishes that satisfy with bold flavors, and there are some lovely, light-touch entrées here that work such magic: a warm oil-poached salmon belly posed over chilled fregola salad set beneath a cracker made from dehydrated salmon skin; gingery soba noodles tangled with miso-glazed shrimp. But Vernick’s grain bowl transcends the whole-food clichés through perfect layering of temperatures and textures, a cool farro-almond salad with Champagne vinaigrette and a tarragon swoop of green goddess dressing that was activated by the rustic warmth of woodsy wild mushrooms. With its creamy fan of ripe avocado and bitter plumes of red endive for scooping, I could eat this weekly. The beef short ribs at Vernick Coffee Bar are cooked in the style of ossobuco. 6. Slow-cooked indulgence. Sometimes, lunch needs to be a meal. This menu doesn’t offer a lot of belly-busting entrées, but a handful of meaty winners deliver soulful flavors from patient cooking. A pork shoulder is brined with herbs and garlic for two days before it’s slow-roasted, then layered with aged provolone, charred radicchio spread, and a tart mince of giardiniera pickles on a sandwich that’s grilled to a panini-press crisp. A homey Staub crock of short ribs, meanwhile, is big enough to share, and those beefy cubes are cooked ossobuco-style to such tenderness that they hold together just long enough to travel by fork to mouth, where they melt away. The seasonal olive oil cake is topped with blood oranges at Vernick Coffee Bar. 7. Just desserts. Sweets? Vernick Coffee Bar has so many, we needed a fancy tiered stand to hold all the choices we couldn’t resist. There was an intensely caramelized apple tart gilded with gold leaf. A pudding-centered canelé pastry whose crunchy, fluted caramel sides were not dulled (not too much) by a delicate chocolate glaze. A moist carrot cake cleverly morphed into pie with a crunchy graham crust. My favorite, though, was the sunburst of blood oranges that moistened an olive oil cake with the sweet-tart essence of winter citrus. Barista Drew Chrisner demonstrates the tableside pour-over coffee at Vernick Coffee Bar inside the Comcast Technology Center in Center City Philadelphia on Thursday, Jan. 10, 2019. 8. Trolley on. Since you’re staying for dessert, you might as well summon the coffee trolley, whose barista will talk you through a made-to-order pour-over that delivers genuinely vivid coffee complexity (loved the plum-cocoa notes of Umbria’s Congo beans), or monitor the ideal steeping time of organic Rishi tea with sleek duo pots and reverse-gravity timers. I’ve had horrific coffee in Philly restaurants over the last year, with French presses that ranged from lukewarm brown water to pureed car tires — so props to Vernick for seeing the possibilities and setting a new restaurant java standard with table-side style. Vernick’s new cafe and restaurant is certainly many fine things. But “coffee bar,” after all, is in the name. There’s so much more than good coffee perking at this restaurant disguised as a “coffee bar,” where star chef Greg Vernick has turned the soaring second-floor space of the Comcast Technology Center lobby into a peaceful oasis to rethink breakfast and lunch in a sleek modern dining room that feels like an urban tree house. Attention to details of service and the white leather-blonde wood design keep it Four Seasons-style posh. But it’s Vernick’s signature culinary approach, with cleverly polished riffs on deceptively simple ideas that elevates familiar dishes, from oatmeal (as a souffle) to grilled romaine salad (gratinée), paninis, soups and elegant pastries to memorable. This project will evolve once a wine bar liquor license arrives. Meanwhile, don’t miss the coffee, which arrives on a pour-over trolley. MENU HIGHLIGHTS Breakfast: Corner Store egg and cheese; kouign-amann; matcha-white chocolate croissant; orange pain au chocolat; sourdough biscuit with marmalade); quiche verte; steel-cut oatmeal soufflé; coconut-chia parfait; English pea hummus with 7-minute egg. Lunch: spicy miso soup; butternut squash soup; grilled romaine with cheddar, figs and buttermilk vinaigrette; chilled shrimp-soba salad; porchetta sandwich; deep dish focaccia; oil-poached salmon with fregola salad; mushroom, avocado grain bowl; braised short rib; carrot cake pie; olive oil cake with blood orange. DRINKS Wine, cider and amari will arrive once the Four Seasons’ hotel liquor license is activated. Meanwhile, fresh-pressed fruit juices and intense shooters are featured alongside seasonal sparkling waters (try the blood orange) and one of the more outstanding coffee and tea services found in local restaurants, dispensed from a tableside trolley. Well-balanced Caffè Umbria beans from Seattle for the house brews are supplemented by a range of local roasters for pour-overs with loose leaf Rishi teas also served with precision and style. WEEKEND NOISE The soaring atrium lobby and wrapped-in-louvered-wood walls absorb sound well, making conversation easy. IF YOU GO Breakfast Mon-Fri, 7-11 a.m.; Lunch Mon-Fri, 11:30 a.m.-3 p.m.; Afternoon menu Mon-Fri, 3-5 p.m.
Reservations accepted, but not required (but recommended for peak lunch hours).